Welcome to Maitri Texfab Pvt. Ltd. [Maitri Texfab Pvt. 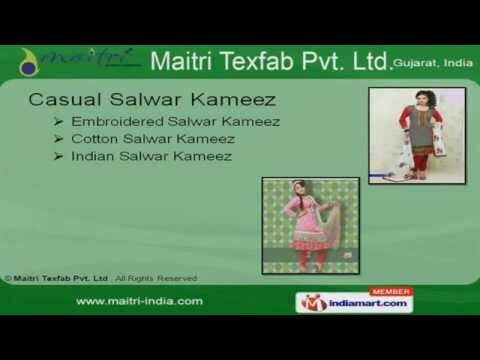 Ltd. ]Manufacturer & Exporter of Indian Salwar Kameez The company was incorporated in the year 1999 at Ahmedabad. Our technically sound infrastructure & customized range of products helped us to gain clientele across Middle East, North America & other countries. Global quality standards, Competitive price policy, Timely delivery schedule are some of our keys to success. Our market base is spread across Indian Subcontinent, East Asia, Middle East, Europe, America & South East Asia. We are engaged in offering Designer Kurtis, Casual, Designer & Fashion Salwar Kameez&#039;s. We provide exclusive range of Embroidered, Cotton & Indian Salwar Kameez at industry leading prices. Our exclusive collection of Designer Kurtis are highly appreciated for their comfortable fitting and soft texture. We provide Designer, Fashion & Georgette salwar kameez are made up of excellent fabric that ensures long life and color fastness. Along with that we offer Traditional & Ethnic Salwar Kameez at industry leading prices.